Mr. Yang wins GSC Award in poster session at 7th JACI/GSC Symposium held on June 14-15th, 2018. His thesis is ‘Electrochemical Properties of Transition Metal Hydroxide – Conductive Polymer Hybrid and Its Orientation in Magnetic Field’. 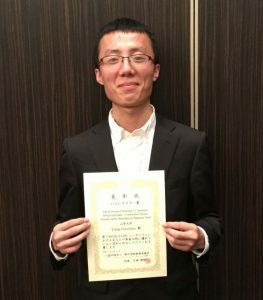 He prepared layered double hydroxide composed of transition metal hydroxide and polyaniline hybrid with/without strong magnetic field for orientation, and examine its electrochemical property for use of supercapacitor.